What is a Cabin Manager? What Duties and Responsabilities? As I mentioned earlier, I was upgraded to Cabin Manager (also called “Purser” in the industry) this year! So what does that mean? Paperwork! So. Much. Paperwork. In all honesty, I don’t find there to be too much of a difference between Flight Attendant and Cabin Manager. -Paperwork: I fill out all the flight reports, briefing sheets, Cabin Logs, Incident Forms, Pay adjustments, Flight Attendant Performance Assessments, Grooming Assessments, Duty Free Deposits, Sales forms, and so on. Most days I’ll fill out as much of my paperwork as possible prior to the flight, and complete everything else as it occurs. That way I can spend a minimal amount of (unpaid) time in the office after the flight catching up on my paperwork. -Announcements: “My name is (Jet), and I am your Cabin Manager on today’s fight. On behalf of your entire Vancouver based crew, we’d like to thank you for choosing to fly (Jetway Airlines). If I or any of your flight attendants can be of assistance, please do not hesitate to ask. Thank you, and welcome aboard.” – Oh how I love the sound of my own voice. Now I officially make all the announcements. -I’m responsible for the flight deck. I have to maintain communication with the front end at least once an hour to make sure the pilots are still alive. I also make sure they are fed and watered and happy. After all: Happy Pilots makes for happy flight flying. -I’m responsible to the flight attendants. I have to make sure everyone’s FA Manuals are up to date, that everyone is certified, that they’re briefed and know their stuff. I’m also supposed to complete an evaluation on 3 FAs per month. -I run the flight. I pace our services and make judgment calls on when it’s necessary to amend a service. -I’m ultimately responsible for the flight: I handle unruly passengers. I’ll make the final decision to deny boarding to someone on the ground or if it’s necessary to land the plane and meet with authorities. I’ll also have to answer to the company when that happens. The upgrade process to CM wasn’t too hard. 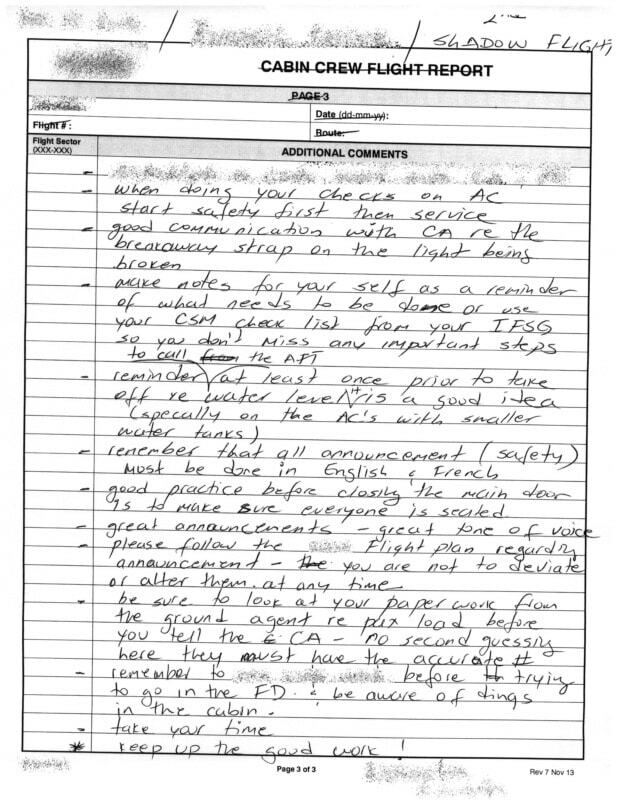 As flight attendants we’re all trained in the duties of a cabin manager, just in case crew scheduling needs to do a temporary upgrade for staffing reasons. Training consisted of 4 days of in class work, with an exam on the last day. The classwork was almost entirely how to fill out all the different kinds of paperwork. I then had to complete two shadow flights. 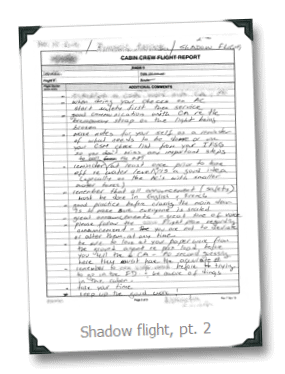 On the first shadow flight; I simply observed the experienced CM while I worked with them in the forward galley. On the second shadow flight I became the lead, and the experienced CM watched me from the galley position. This was a very stressful day. Not only am I jumping into a role I’ve never done before, I have someone watching over my shoulder taking notes on everything I do, right or wrong. I think I made more mistakes on my shadow simply because I knew someone was watching. Overall that day went well. I had to handle passengers drinking their own alcohol, and our services were slow because we had two fresh-out-of-training FAs on board, but we got through the day unscathed. 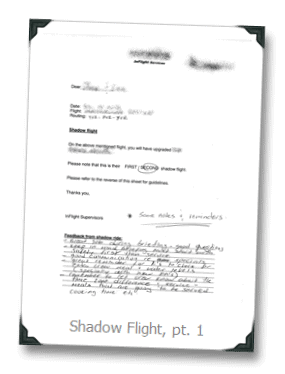 I spent some time chatting with a few passengers about my shadow flight, I exaggerated a little and told them it was my “make or break” flight. (which isn’t true, unless I did exceptionally poorly). 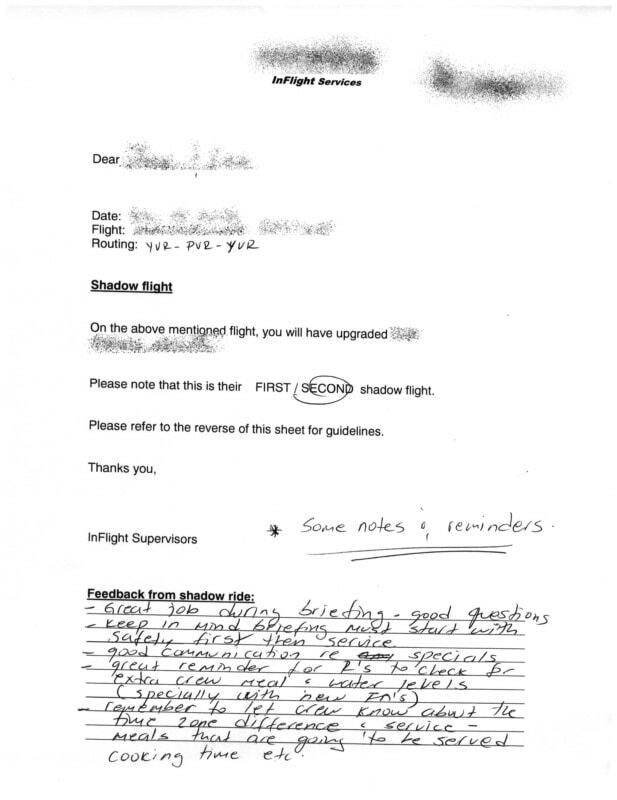 Click the Polaroids attached to this post for some of the official feedback as I received from my shadow flight. Edited of course as not to reveal my real name, airline, or any sensitive security protocol.